It all began when a deaf boy who was not even loved by his own family was discovered by us. The boy's life got literally changed after then. He learnt the art and craft of making different kinds of handmade products and was also able to earn some money from the profit that came from the products. As he became independent and able to earn for himself, his family also starting loving him more. This event was an inspiration to us. An inspiration to broaden our reach and help as many people as we possibly could. 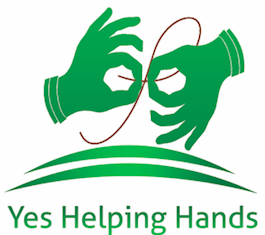 Helping Hands Handicrafts, which first started by providing trainings to deaf and blind to make them economically and emotionally independent was able to extend helping hands to people with all kinds of disabilities as well as trafficked girls/women and all the people who are less loved by our society. It all works in a cycle. First, we recruit these people and provide skill trainings to them whilst also providing them with food to eat and a roof to stay under. Then, we sell the products handmade by them and distribute the profits. What remains is again used to help other people who need help. Little by little, Helping Hands has been able to donate to 3 schools which precisely run through this donations, rebuild 672 homes destructed by the earthquake and have helped change 180 lives until now. We are well recognized for our fair trade and bring our fibre from Ladak, Tibet and Nepal; all of which are also an effort to make women economically powerful. ' Dirty hands and damaged lives make beautiful products.' Help us widen our reach, shop with us today. Why wool for the winter? Wool has unique properties that aren’t emulated by any other fiber. While it’s fairly resistant to water, wool can also absorb moisture vapor from your skin and release it out into the drier air, so you don’t remain wet. Besides, our fabric are also made with love so that you will always feel warm, inside and out. Himalayan Sheep- Almost every product made from the himalayan sheep is used to sustain the life of the herdsmen and their families and is used either directly or sold to provide an income. Our products handmade from these sheep have helped many lives than we could tell. Handmade by village artisans in the Himalayas of Nepal, our sustainable, ethical scarves are made of a high quality with a feel that is naturally soft & breathable. Over the course of time, Helping Hands has changed the lives of hundreds of men and women. Using some of the world's oldest weaving techniques, each product is made with care and love from dye, to stitch, to your loving arms. Yeshelpinghands designs, produces and sells timeless yak and sheep textiles made by differently abled people. We are committed to working in a socially responsible way: combining a highly skilled workforce with a rare raw material (yak wool) to make world-class products while advancing the livelihood of local people through stable employment. Our Team comprises of differently able people, trafficked women and all people who deserve to be treated better but are outcasted by their own family and society. We aim to give them a chance to be independent and live their life. Yeshelpinghands designs, produces and sells timeless yak and sheep textiles made by differently able people and trafficked women. This process includes providing job opportunities to the women living in the Himalayas to empower them and help them uplift their living status. These goods come to profuction and get used by differently able ad trafficked women to learn and craft beautiful products. The money obtained by selling these products is spent on the skill giving program and for the manufacture of the goods. The only way the society will accept them is when they gain independence and the only way to escape poverty, discrimination and exploitation is by being economically empowered. Help them get economically empowered, buy our products.